It’s playoff time again, which means it’s also time for our Breaking It Down series. That’s where I – and I alone – take a look at the post-season matchups and provide is a snapshot of the action to come. 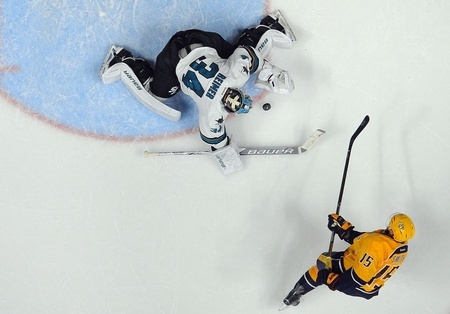 This edition features a look at the second round matchup between the Nashville Predators and San Jose Sharks. Game One is on Friday. Nashville hasn’t had a lot of luck in the post-season against San Jose, with two first round losses in 2006 and 2007. And the Sharks are well-rested, too, having polished off the Los Angeles Kings in five games. By the time Game One of their series against the Predators gets underway, they’ll have had about a week off. But Nashville will be hungry to advance to the conference final for the first time and they did have the Sharks’ number in the regular season, winning two of three meetings. They have a well-rounded team and they’ve received exemplary goaltending from Pekka Rinne, which could spell trouble for San Jose. San Jose received quality, workmanlike goaltending from Martin Jones. The 26-year-old from North Vancouver went 4-1 with a 2.18 goals against average and a .912 save percentage. He took the edge, even when games were close, and showed an ability to handle the workload. In three of the five games against the Kings, Jones allowed two or fewer goals. Rinne may not have been at his best at the beginning of Nashville’s series against the Ducks, but he pulled out two remarkable performances in Game Six and Game Seven and won when it mattered most. The 33-year-old is 4-3 in this year’s playoffs, with a 2.45 goals against average and a .915 save percentage. Nashville likes to activate the D, which is why their blueliners were especially troublesome for the Ducks in the first round. Shea Weber had five points in seven games, including two goals, and he’s capable of playing a half hour a night. Roman Josi had three assists and also floated around the 30-minute mark, while 25-year-old Mattias Ekholm had two goals against Anaheim. The Sharks got some serious offence from Brent Burns, who piled up eight points against Los Angeles. He averaged 23:58 per game and is one of the fastest players on the transition in the game today. Burns was paired with Paul Martin for most of the first round, which grants the duo stability and allows for extra mobility out of their own end. The top line of Joe Thornton, Joe Pavelski and Tomas Hertl was dominant for the Sharks. They scored seven of San Jose’s 16 goals against the Kings and propelled the attack. Pavelski had five goals, while Thornton’s impeccable passing cracked open the opposition and created scoring chances. Because the Sharks roll four lines, their top line gets plenty of rest and sees plenty of action. Nashville’s Colin Wilson had five points against the Ducks and he’s a sure bet for more against San Jose. He’s been skating well with Mike Fisher and Viktor Arvidsson. The Predators also found gold in Game Six by shifting Filip Forsberg to a line with James Neal and Ryan Johansen. The 21-year-old Forsberg had three points against Anaheim and could be primed to break out against the Sharks. San Jose has had a lot of time off between games and that could provide them with rest or rust, depending on how you look at it. They may have some difficulty finding their game, at least right out of the gate, but it shouldn’t take long to make a series out of the second round. The Sharks enjoyed the benefits of a killer power play, with five goals coming on the man-advantage against the Kings. Unfortunately for the Predators, they didn’t do so well with the extra skater and only converted once in 26 tries. If this series comes down to special teams, Nashville could be in for a tough run. With these factors in mind, I’m siding with a San Jose series victory in six games.